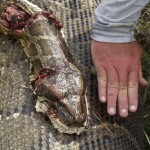 Work crews in western Miami-Dade County, Fla., Thursday discovered a 16-foot Burmese python in the process of digesting a fully grown deer, the largest intact prey ever discovered in a Burmese python in the Sunshine State. 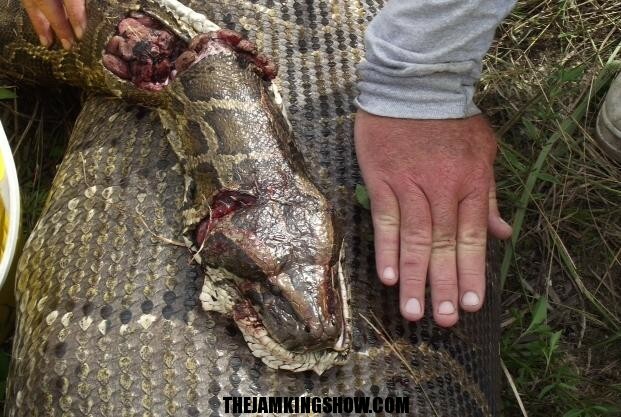 The snake was on a tree island, and it was killed with a shotgun. An autopsy revealed that the snake had just swallowed a 76-pound doe (meaning that the hungry python didn’t have antlers to contend with). “It shows you they can eat huge things,” said python expert Skip Snow, rather obviously, to the South Florida Sun Sentinel. Snow conducted the autopsy on the snake. 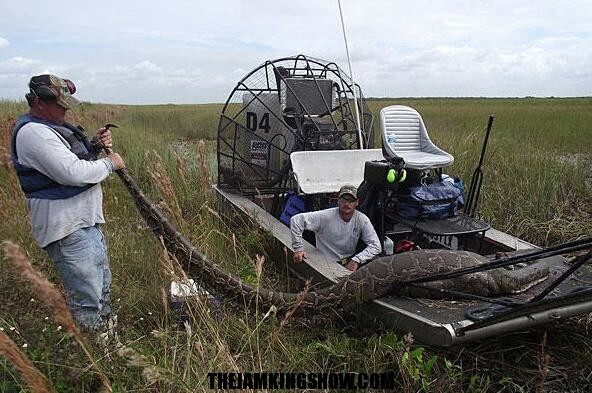 Burmese pythons are threatening to become the top predator in the Everglades. The snakes began to take hold in the region in the mid-1990s, after being released into the wild by overwhelmed owners of the exotic pets, who realized that they may have bitten off more than they could chew – a characteristic not shared by reptiles capable of unhinging their jaws. The pythons are currently restricted to southern Florida, but researchers have determined that the species could survive as far north as Washington, D.C. (The snake is no stranger to cold, as its natural habitat extends to the foothills of the Himalayas.) Perhaps more worrying is the prospect that the species is interbreeding with the man-eating African rock python, yielding an extremely aggressive hybrid. A study published in the current issue of Science found that postprandial pythons, which rapidly double the size of their hearts, livers, intestines, and kidneys, do so by expanding the cells in these organs through a process called hypertrophy. The process is spurred by a combination of fatty acids, that, when injected into a mouse, produce similar growth.